The index opened strong above 7930, and went on to stay within a narrow range of 20 points for the better part of the day, with only dip towards the lows strongly grabbed by the Buyers. The index closed at all-time high at 7936.05, gain of 31.30 points. The broader market though was also positive, with 852 advances to 695 declines. The range for Expiry boils down to 7890-8000. 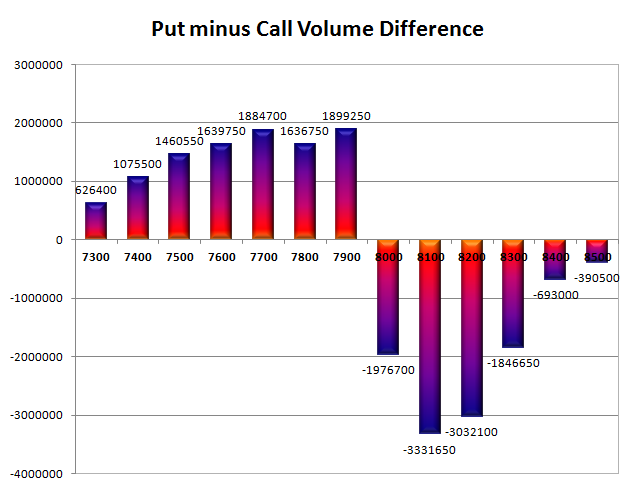 Call option 8000 added huge 6.81 lacs OI with short covering seen at 7900 and below strike prices. Put option 8000-7900 added huge 12.87 lacs OI with profit booking seen at 7800 and below strike prices. Nifty Open Interest is at 88,54,000 down by 16,57,100, whereas Sep Series added 42.72 lacs with increase in price, 100% rollover with huge long build-up. Bank Nifty Open Interest is at 14,11,475 down by 1,89,500, whereas Sep Series added 3.32 lacs with increase in price, 100% rollover with huge long build-up. FII’s bought huge 5.38 lacs Futures, which includes 31663 contracts long build-up and 20908 contracts short build-up, with increase in net OI by 52571 contracts (includes 148818 longs to 138063 shorts for the day) and the average price per contract comes to around 7946.50. FII’s Index future open contract as on date is 236817 Longs to 112013 Shorts, net long 124804 contracts. PCR Open Interest (Volume) is at 1.317. 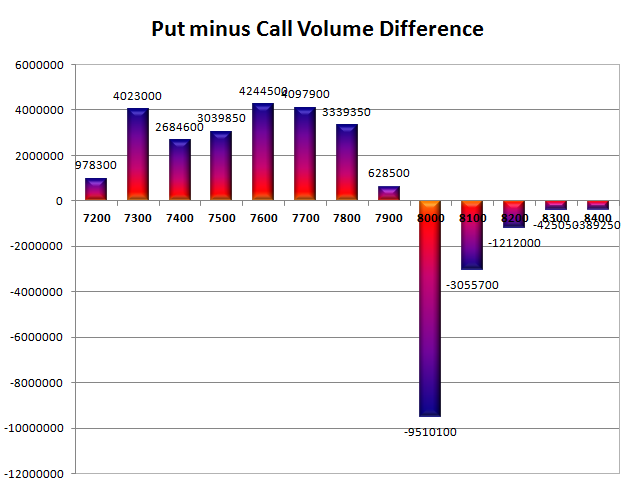 Initial and best support at 7900, with huge OI of 59.60 lacs. Initial and best resistance at 8000, with highest OI of 1.04 crore. 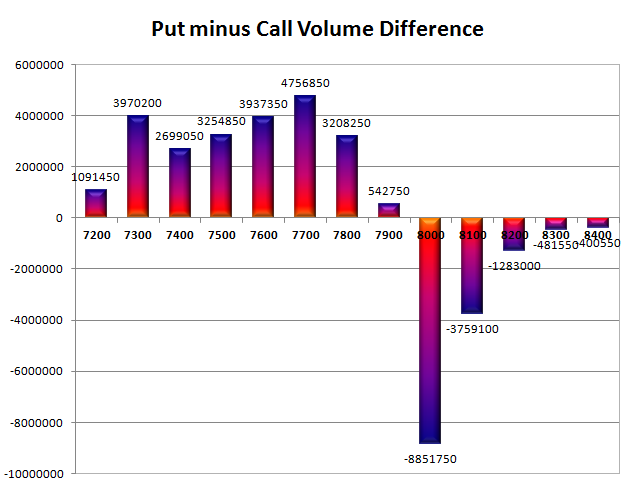 Day Range as per Option Table is 7886 - 7983 and as per VIX is 7882 - 7990 with 7933 as the Pivot. The index opened weak below 7900, but went up to touch the highs of the day at 7915 within the first hour of trade only to be sold off to the lows of the day around 7862. The responsive buyer took control and moved the index in green but was adjusted at 7904.75, loss of just 1.55 points. The broader market though was very weak, with 516 advances to 1045 declines. The range till Expiry has narrowed down to 7800-8000. 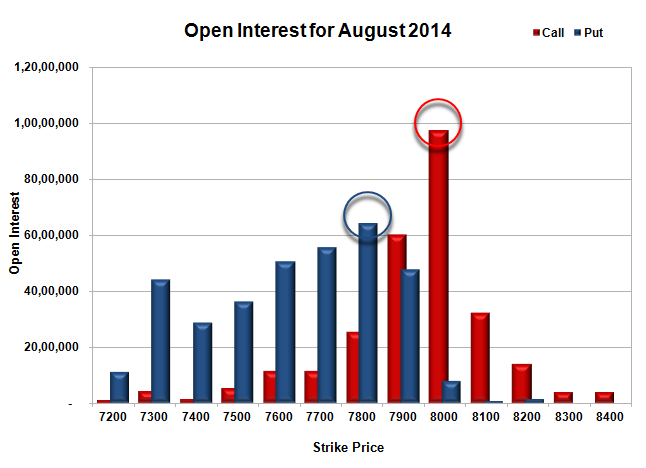 Call option 7900 added huge 10.66 lacs OI with profit booking seen at 8000 and above strike prices. 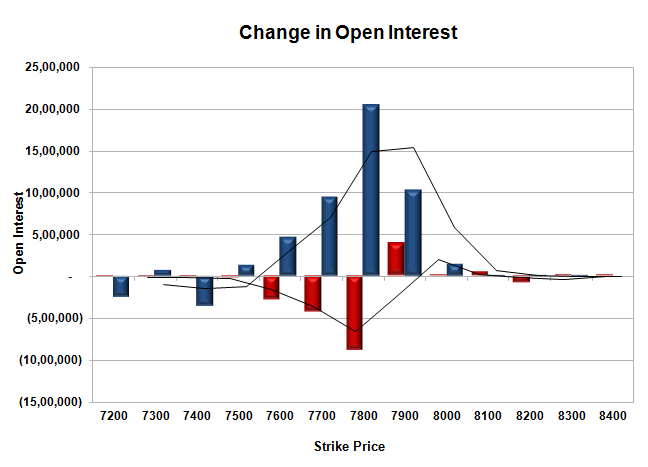 Put option 7800 added 1.95 lacs OI with short covering seen at 7900 and above strike prices. Nifty Open Interest is at 1,05,11,100 down by 23,21,650, whereas Sep Series added 23.94 lacs with small decrease in price, 100% rollover with small short build-up. Bank Nifty Open Interest is at 16,00,975 down by 2,29,300, whereas Sep Series added 1.76 lacs with decrease in price, mostly rollover with huge long liquidation. FII’s bought 3.36 lacs Futures, which includes 3768 contracts long build-up and 2951 contracts short covering, with increase in net OI by 817 contracts (includes 121341 longs to 114622 shorts for the day) and the average price per contract comes to around 7909.19. FII’s Index future open contract as on date is 205154 Longs to 91105 Shorts, net long 114049 contracts. PCR Open Interest (Volume) is at 1.252. 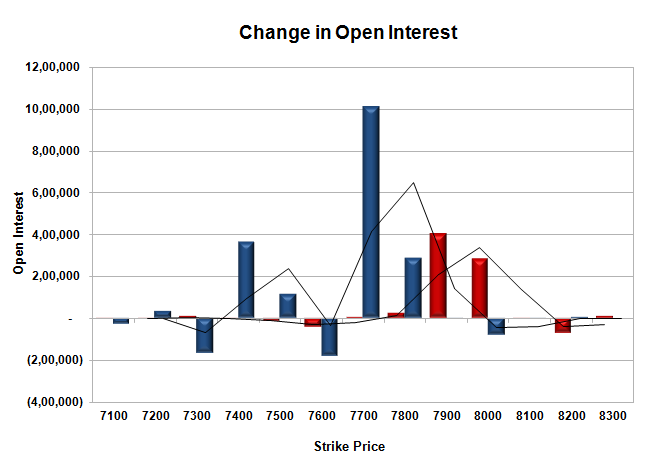 Initial and best support at 7800, with huge OI of 64.20 lacs. Initial resistance at 7900, with huge OI of 60.09 lacs and above that at 8000 with highest OI of 97.52 lacs. 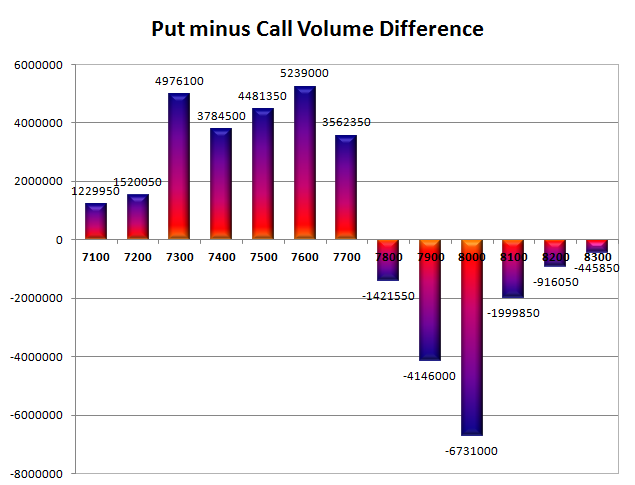 Day Range as per Option Table is 7845 - 7947 and as per VIX is 7847 - 7962 with 7894 as the Pivot. The index opened above all time high and stayed strong to make new highs with each passing hour, but huge profit booking during the last hour of trade saw the index nose-dive and close in the Red at 7906.30, a small loss of 6.90 points. The broader market was also negative, with 588 advances to 974 declines. Range has narrowed down to 7800-8000. 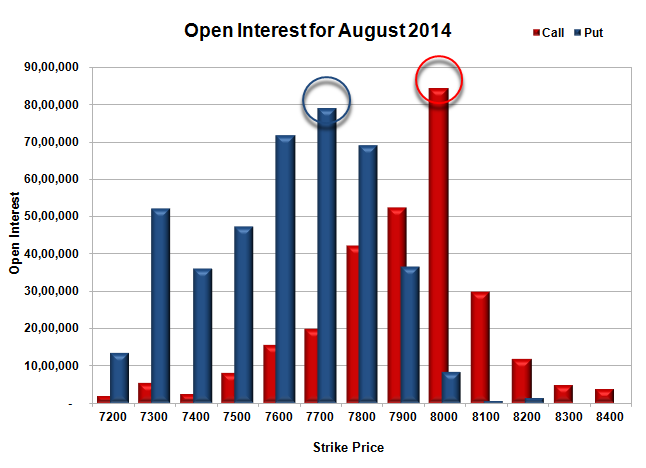 Call option 8000 added huge 8.64 lacs OI with short covering seen at 7800 and lower strike prices. Put option 8000-7900 added huge 7.85 lacs OI with profit booking seen at 7800 and lower strike prices. Nifty Open Interest is at 1,28,32,750 down by 15,33,550, whereas Sep Series added 11.78 lacs with small decrease in price, mostly rollover with small long liquidation. Bank Nifty Open Interest is at 18,30,275 down by 2,55,325, whereas Sep Series added 2.25 lacs with huge decrease in price, mostly rollover with small long liquidation. FII’s bought 2.38 lacs Futures, which includes 379 contracts long build-up and 4379 contracts short covering, with decrease in net OI by 4000 contracts (includes 78207 longs to 73449 shorts for the day) and the average price per contract comes to around 7911.92. FII’s Index future open contract as on date is 201386 Longs to 94056 Shorts, net long 107330 contracts. PCR Open Interest (Volume) is at 1.259. 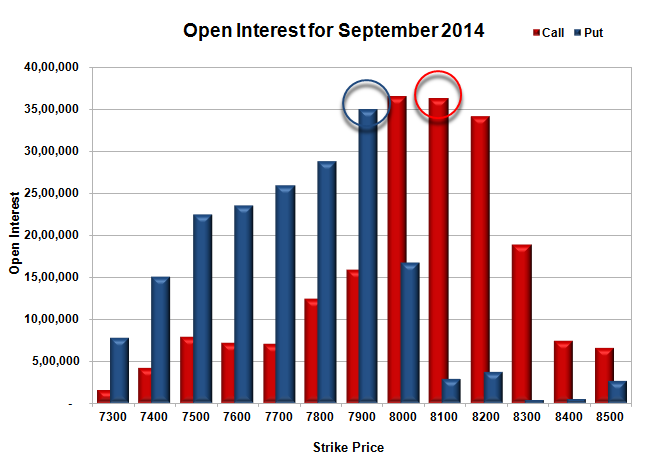 Initial support at 7900, with huge OI of 54.86 lacs, whereas next support is at 7800 with huge OI of 62.25 lacs. Initial and best resistance at 8000, with highest OI of 99.15 lacs. 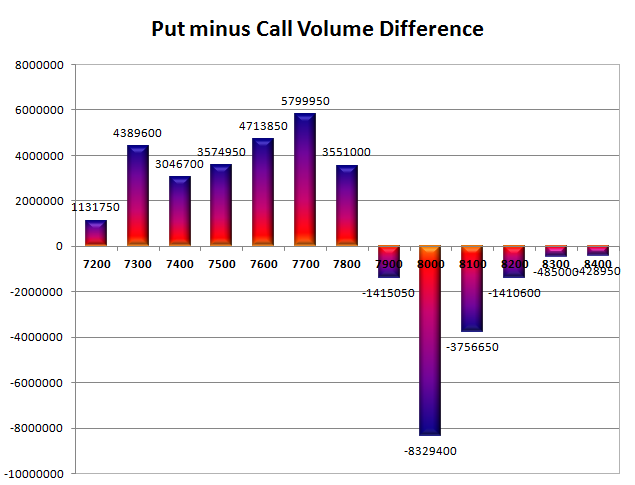 Day Range as per Option Table is 7867 - 7973 and as per VIX is 7849 - 7963 with 7924 as the Pivot. The index opened just above 7900 and stayed in a very narrow range of just 29 points for the entire session of trade not falling below 7900 to close at 7913.20, a small gain of 22.10 points. On a week on week basis the index gained 121.50 points or approx 1.56%. The broader market though was negative, with 746 advances to 806 declines. Range has narrowed down to 7800-8000. 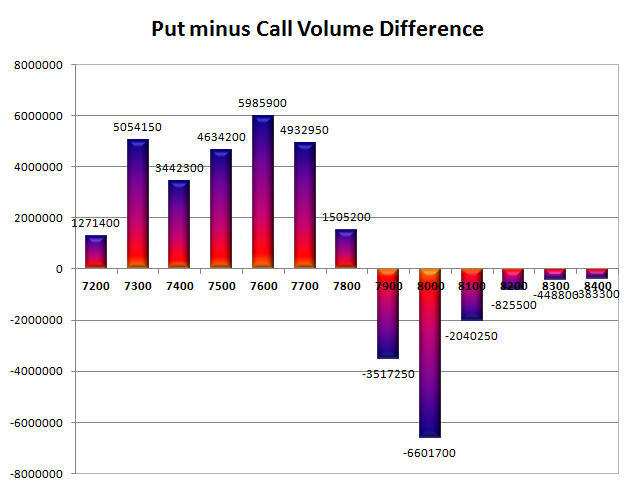 Call option 8100 added huge 6.84 lacs OI with short covering seen at 7900 and lower strike prices. Put option 8000-7900 added huge 6.91 lacs OI with profit booking seen at 7800 and lower strike prices. Nifty Open Interest is at 1,43,66,300 down by 3,17,450, whereas Sep Series added 4.61 lacs with small increase in price, 100% rollover with small long addition. Bank Nifty Open Interest is at 20,85,600 up by 59,400, whereas Sep Series added 0.71 lacs with huge increase in price, mostly long addition in both series. FII’s bought huge 5.64 lacs Futures, which includes 9621 contracts long build-up and 1664 contracts short covering, with increase in net OI by 7957 contracts (includes 47675 longs to 36390 shorts for the day) and the average price per contract comes to around 7928.72. 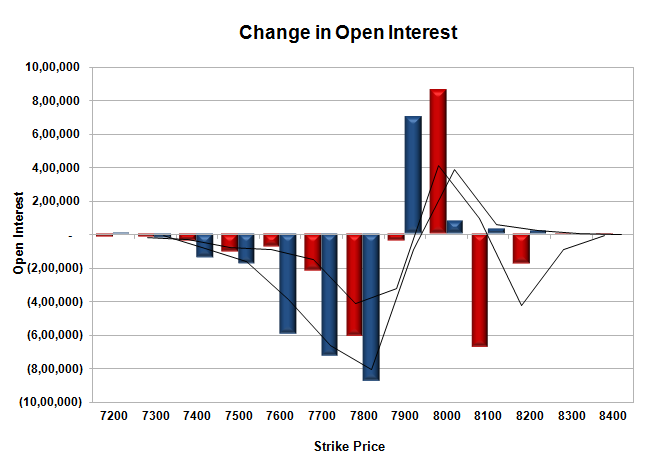 FII’s Index future open contract as on date is 201007 Longs to 98435 Shorts, net long 102572 contracts. PCR Open Interest (Volume) is at 1.255. Initial and best support at 7800, with huge OI of 71.01 lacs, whereas next support is at 7700 with huge OI of 69.65 lacs. Initial and best resistance at 8000, with highest OI of 90.51 lacs. 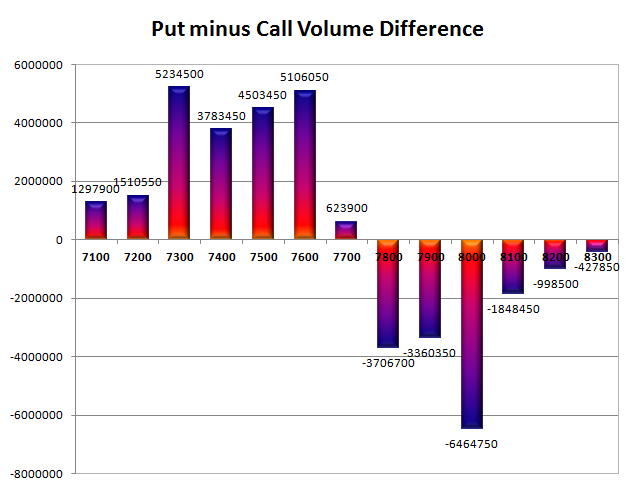 Day Range as per Option Table is 7861 - 7967 and as per VIX is 7857 - 7970 with 7914 as the Pivot. 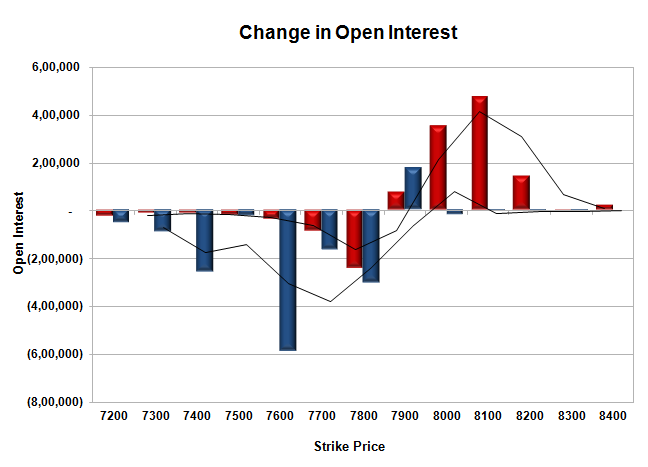 The index opened flat, but saw buying interest to move towards the highs of the day at 7820, but profit booking from higher levels pushed Nifty to the lows of the day around 7856. Some buying interest at lower levels saw the index close at 7891.10, a small gain of 15.80 points. The broader market was also positive, with 835 advances to 698 declines. Range still at 7700-8000. 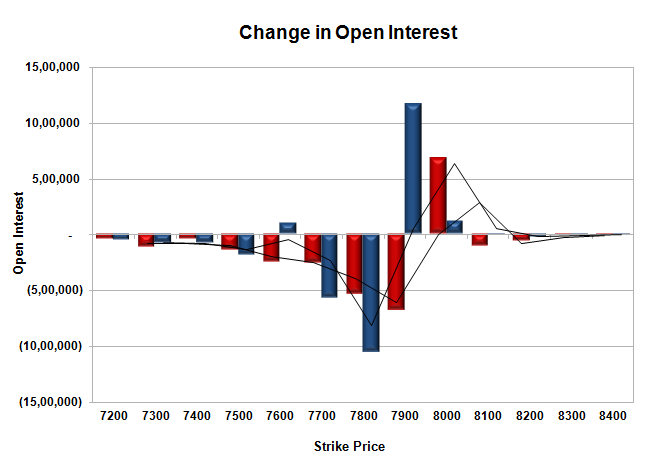 Call option 7900-8200 added huge 13.30 lacs OI with short covering seen at 7800 and lower strike prices. Put option 8000-7800 added huge 11.35 lacs OI with profit booking seen at 7700 and lower strike prices. Nifty Open Interest is at 1,46,83,750 down by 3,85,750, whereas Sep Series added 3.13 lacs with small increase in price, mostly rollover with short covering. Bank Nifty Open Interest is at 20,26,200 up by 1,50,175, whereas Sep Series added 0.77 lacs with huge increase in price, mostly long addition in both series. FII’s sold 2.00 lacs Futures, which includes 958 contracts long liquidation and 3050 contracts short addition, with increase in net OI by 2092 contracts (includes 40201 longs to 44209 shorts for the day) and the average price per contract comes to around 7895.80. FII’s Index future open contract as on date is 191386 Longs to 100099 Shorts, net long 91287 contracts. 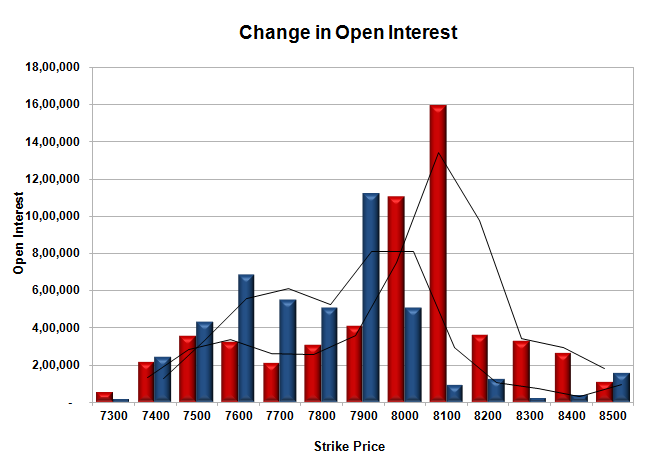 PCR Open Interest (Volume) has moved a bit down to 1.297. Initial and super support at 7800, with huge OI of 73.20 lacs, whereas best support is at 7700 with huge OI of 76.05 lacs. Initial resistance still at 7900, with huge OI of 55.89 lacs, whereas best resistance at 8000 with highest OI of 92.29 lacs. 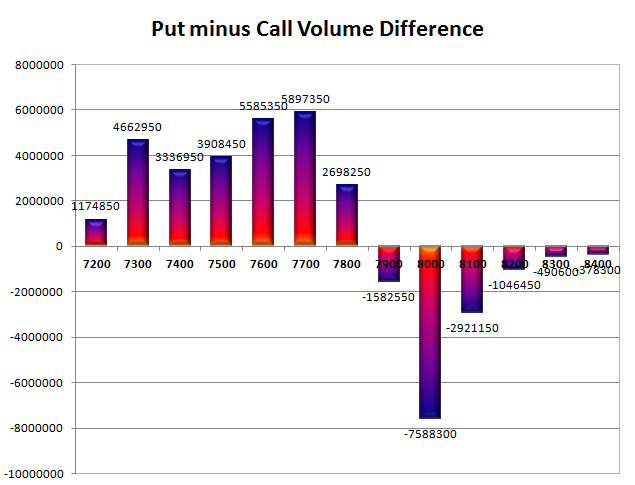 Day Range as per Option Table is 7832 - 7945 and as per VIX is 7834 - 7948 with 7889 as the Pivot. The index opened positive near the highs of the day around 7916, but was not able to sustain the highs and closed near the lows of the day at 7875.30, a small loss of 22.20 points. The broader market though was positive, with 861 advances to 688 declines. Range still at 7700-8000. 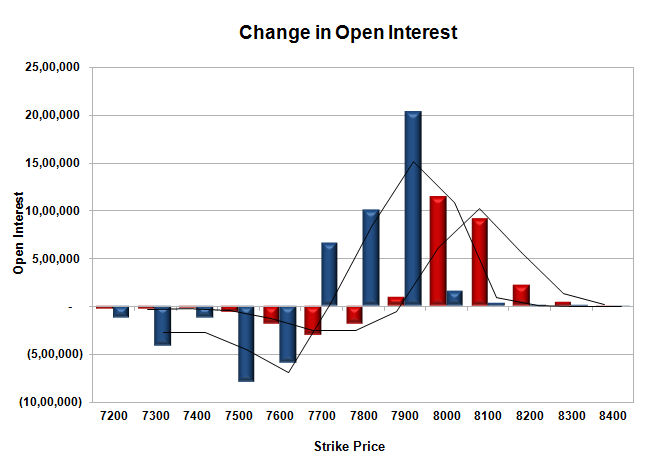 Call option 7900-8200 added huge 10.50 lacs OI with short covering seen at 7800 and lower strike prices. 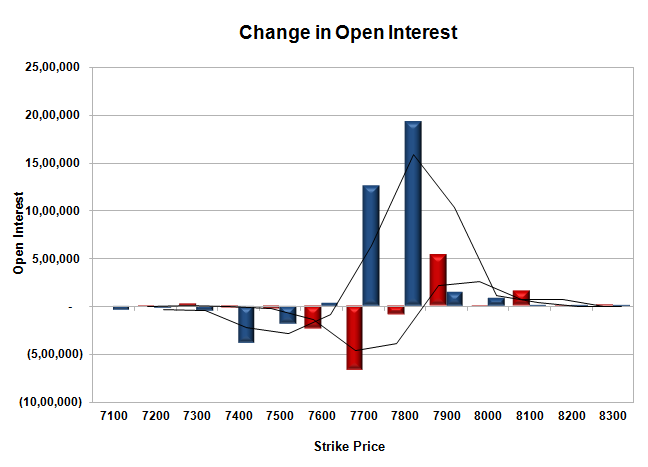 Put option 7900 added 1.78 lacs OI with profit booking seen at 7800 and lower strike prices. Nifty Open Interest is at 1,50,69,500 down by 1,58,850, whereas Sep Series added 1.19 lacs with small decrease in price, mostly rollover with small long liquidation. Bank Nifty Open Interest is at 18,76,025 down by 57,100, whereas Sep Series added 0.30 lacs with decrease in price, mostly rollover with long liquidation. FII’s bought 3.52 lacs Futures, which includes 2777 contracts long build-up and 4255 contracts short covering, with decrease in net OI by 1478 contracts (includes 34039 longs to 27007 shorts for the day) and the average price per contract comes to around 7874.40. FII’s Index future open contract as on date is 192344 Longs to 97049 Shorts, net long 95295 contracts. PCR Open Interest (Volume) is still at 1.339. Initial and very good support at 7800, with huge OI of 66.09 lacs, whereas best support is at 7700 with huge OI of 77.25 lacs. 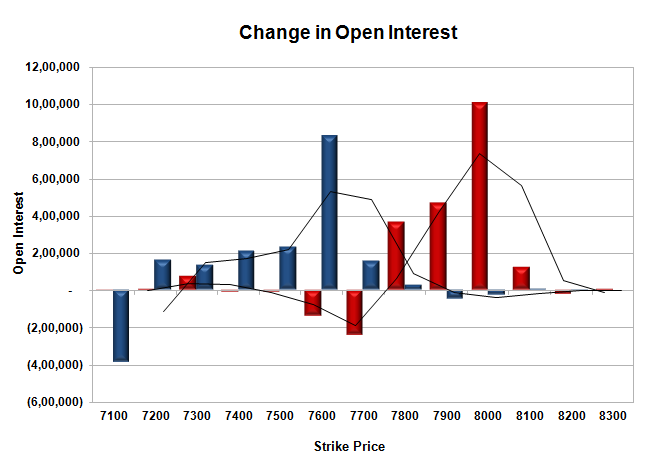 Initial resistance at 7900, with huge OI of 53.08 lacs, whereas best resistance at 8000 with highest OI of 87.81 lacs. 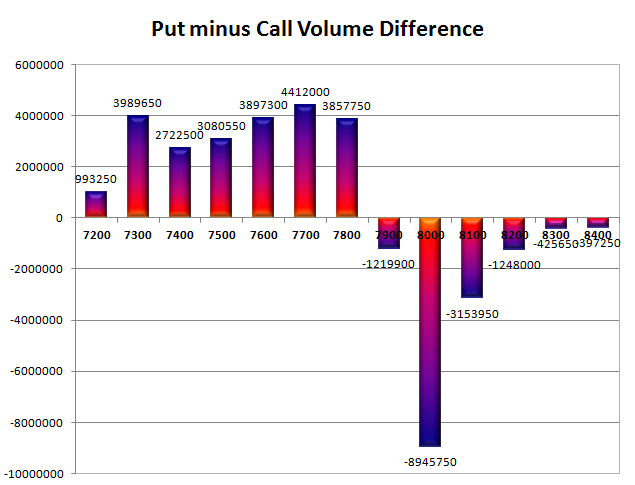 Day Range as per Option Table is 7825 - 7941 and as per VIX is 7819 - 7932 with 7887 as the Pivot. The index opened positive just above 7900, and stayed in a narrow range of 37 points for the entire session of trade with positive bias and closed just below 7900 at 7897.50, gain of 23.25 points. The broader market was also positive, with 934 advances to 602 declines. Range still at 7700-8000. 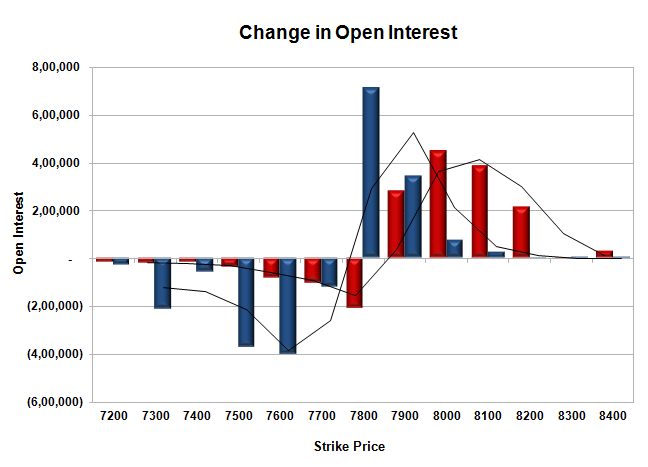 Call option 7900-8200 added huge 23.66 lacs OI with short covering seen at 7800 and lower strike prices. Put option 8000-7700 added huge 38.48 lacs OI with profit booking seen at 7600 and lower strike prices. 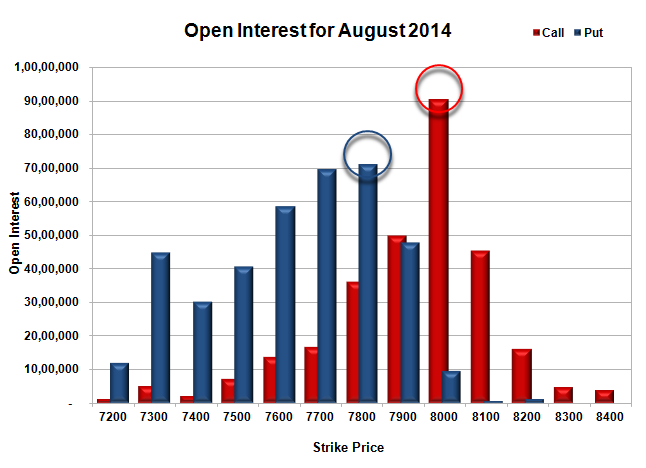 Nifty Open Interest is at 1,52,28,350 up by 1,93,850, with increase in price, most probably long build-up. 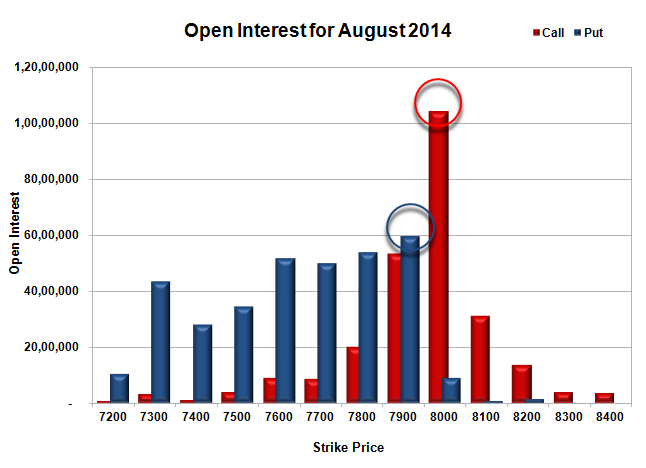 Bank Nifty Open Interest is at 19,33,125 up by 66,950, with increase in price, most probably huge long build-up. FII’s bought huge 5.71 lacs Futures, which includes 9083 contracts long build-up and 2333 contracts short covering, with increase in net OI by 6750 contracts (includes 51853 longs to 40437 shorts for the day) and the average price per contract comes to around 7892.12. FII’s Index future open contract as on date is 189567 Longs to 101304 Shorts, net long 88263 contracts. PCR Open Interest (Volume) is still at 1.416. Initial and super support now at 7800, with huge OI of 69.13 lacs, whereas next support is at 7700 with huge OI of 78.92 lacs. Initial resistance still at 7900, with huge OI of 52.32 lacs, whereas best resistance at 8000 with highest OI of 84.26 lacs. Day Range as per Option Table is 7837 - 7958 and as per VIX is 7840 - 7955 with 7899 as the Pivot. The index opened flat to negative just below 7800 but saw huge buying interest from the morning itself to move higher and higher with each passing hour. The index closed near the highs of the day just below 7900 at 7874.25, a huge gain of 82.55 points. The broader market was also very strong, with 1118 advances to 426 declines. Range has moved up to 7700-8000. 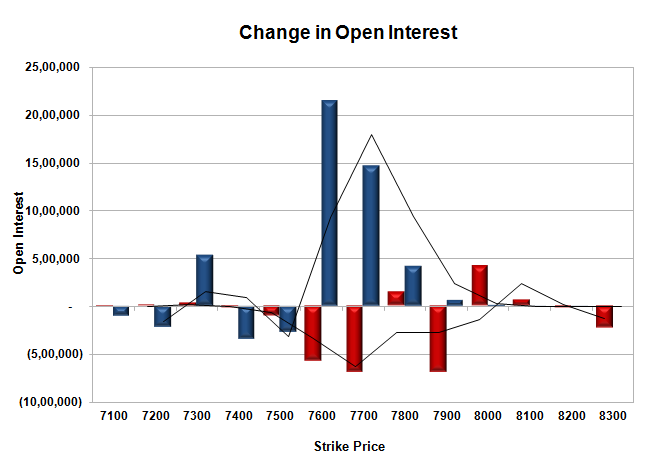 Call option 7900-8100 added huge 4.60 lacs OI with short covering seen at 7800 and lower strike prices. Put option 8000-7500 added huge 47.56 lacs OI with profit booking seen at 7400 and below strike price. 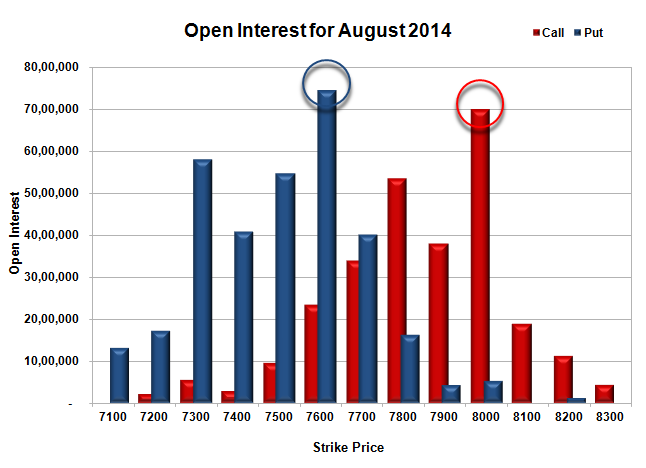 Nifty Open Interest is at 1,50,34,500 up by 6,41,100, with increase in price, most probably long build-up. 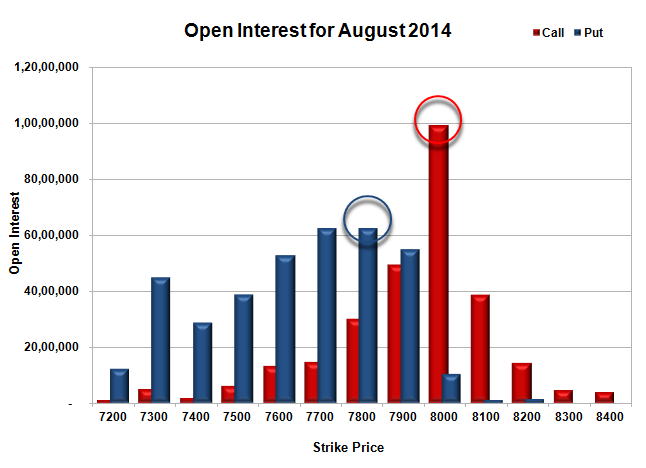 Bank Nifty Open Interest is at 18,66,175 up by 2,38,075, with increase in price, most probably huge long build-up. FII’s bought 2.77 lacs Futures, which includes 6980 contracts long build-up and 1446 contracts short build-up, with increase in net OI by 8426 contracts (includes 52678 longs to 47144 shorts for the day) and the average price per contract comes to around 7858.15. 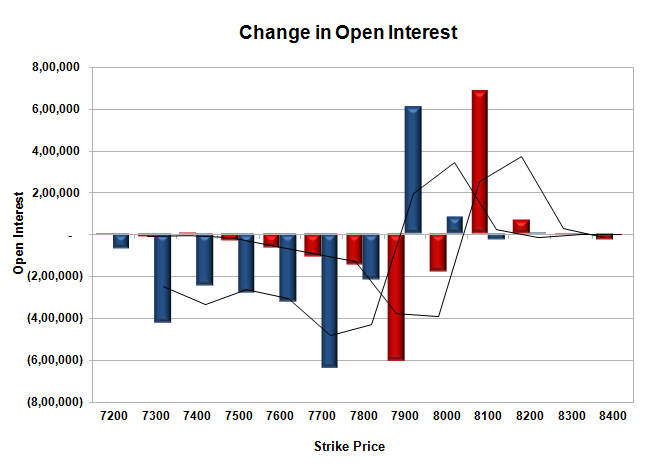 FII’s Index future open contract as on date is 180484 Longs to 103637 Shorts, net long 76847 contracts. PCR Open Interest (Volume) has galloped to 1.418. 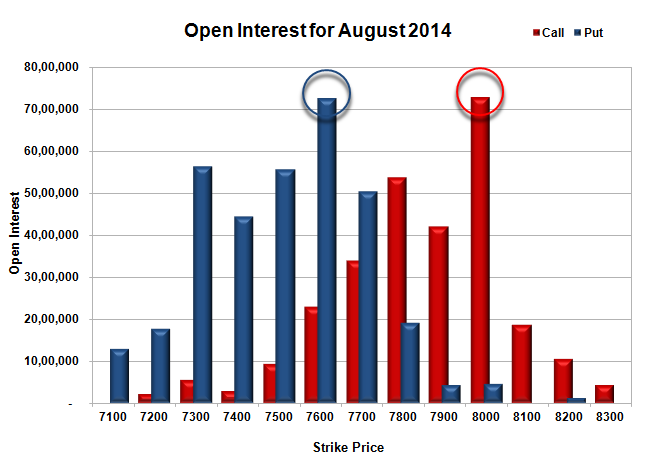 Initial support now at 7800, with huge OI of 59.06 lacs, whereas next support at 7700 with huge OI of 72.32 lacs. Initial resistance at 7900, with huge OI of 51.42 lacs, whereas best resistance still at 8000 with huge OI of 72.84 lacs. 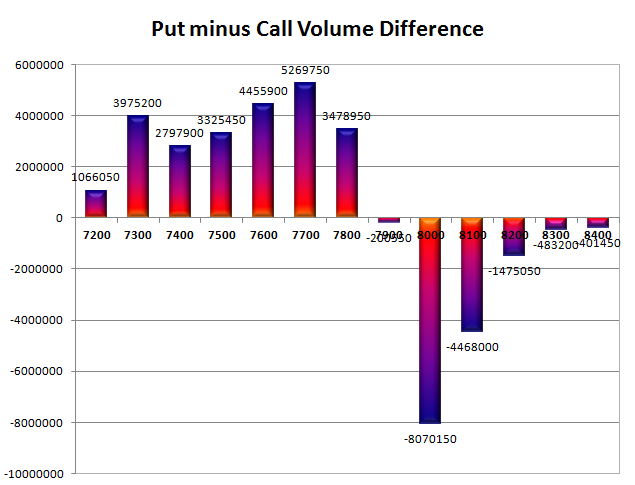 Day Range as per Option Table is 7788 - 7914 and as per VIX is 7819 - 7930 with 7845 as the Pivot. The index opened strong just below 7700 level and stayed in a narrow range for the better part of the only to see huge short covering rally in last hour to close near the highs of the day at 7727.05, a huge gain of 101.10 points. The broader market was just positive, with 854 advances to 655 declines. Range for the time being at 7600-8000. 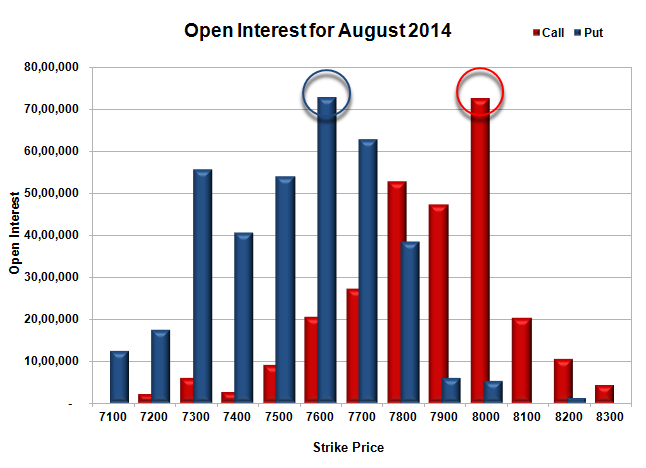 Call option 7800, 8000 added huge 5.69 lacs OI with short covering seen at 7700 and below strike prices. Put option 7800-7600 added huge 40.20 lacs OI with profit booking seen at 7500 and below strike price. Nifty Open Interest is at 1,28,58,300 up by 3,43,200, with increase in price, most probably long build-up. 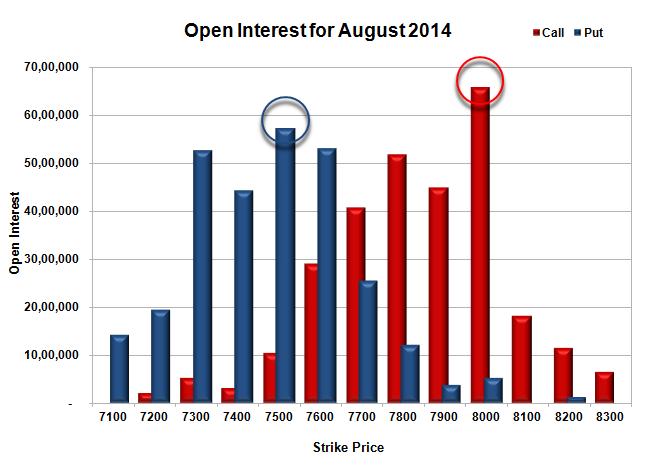 Bank Nifty Open Interest is at 15,56,275 up by 26,475, with increase in price, most probably long build-up. FII’s bought huge 18.11 lacs Futures, which includes 10668 contracts long build-up and 25546 contracts short covering, with decrease in net OI by 14878 contracts (includes 72804 longs to 36590 shorts for the day) and the average price per contract comes to around 7718.38. FII’s Index future open contract as on date is 136401 Longs to 99021 Shorts, net long 37380 contracts. PCR Open Interest (Volume) has managed to move above 1 and now at 1.109. Initial support at 7700, with huge OI addition of 14.60 lacs for the day whereas best support at 7600 with highest OI of 74.43 lacs. Initial and good resistance at 7800, with huge OI of 53.46 lacs, whereas best resistance still at 8000 with OI of 70.03 lacs. 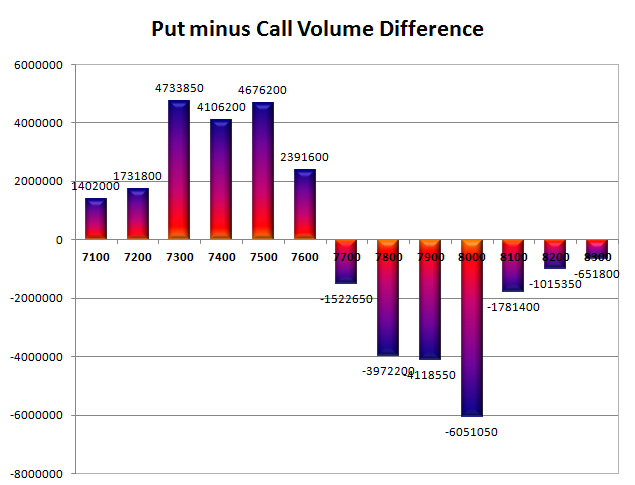 Day Range as per Option Table is 7644 - 7781 and as per VIX is 7673 - 7782 with 7706 as the Pivot. The index opened strong above 7600 and stayed well over it for the entire session of trade to close near the high at 7625.95, a huge gain of 57.40 points. The broader market was also strong, with 933 advances to 607 declines. Range for the time being still at 7500-8000. Call option 7800-8100 added huge 19.65 lacs OI with short covering seen at 7700 and below strike prices. Put option 7700-7200 added huge 17.25 lacs OI with profit booking seen at 7100 and below strike price. 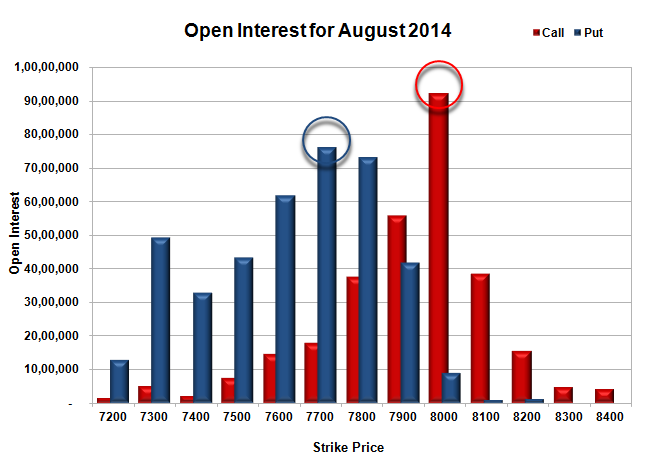 Nifty Open Interest is at 1,25,15,100 up by 3,12,100, with increase in price, most probably long build-up. 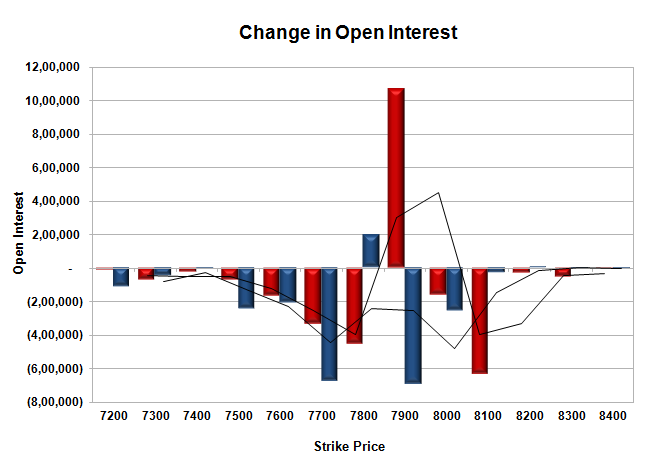 Bank Nifty Open Interest is at 15,29,800 down by 35,775, with increase in price, most probably short covering. FII’s bought 2.16 lacs Futures, which includes 3234 contracts long build-up and 1077 contracts short covering, with increase in net OI by 2157 contracts (includes 31564 longs to 27253 shorts for the day) and the average price per contract comes to around 7610.27. FII’s Index future open contract as on date is 125733 Longs to 124567 Shorts, net long 1166 contracts. PCR Open Interest (Volume) is still below 1 at 0.929. 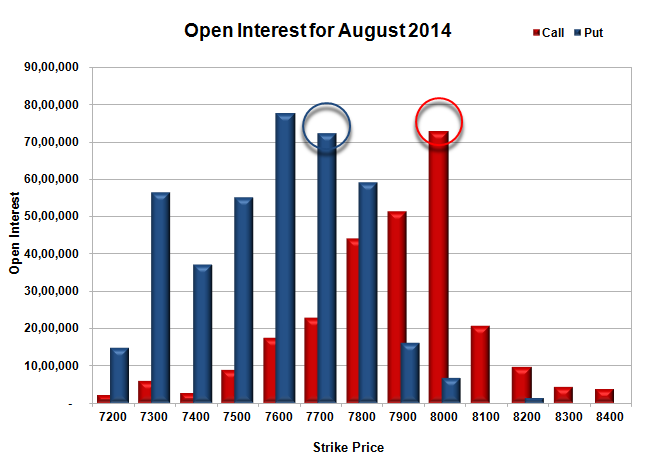 Initial support at 7600, with huge OI of 53.00 lacs whereas best support at 7500 with OI of 57.34 lacs. Initial resistance now at 7700, with huge OI of 40.84 lacs, whereas best resistance still at 8000 with highest OI of 65.86 lacs. 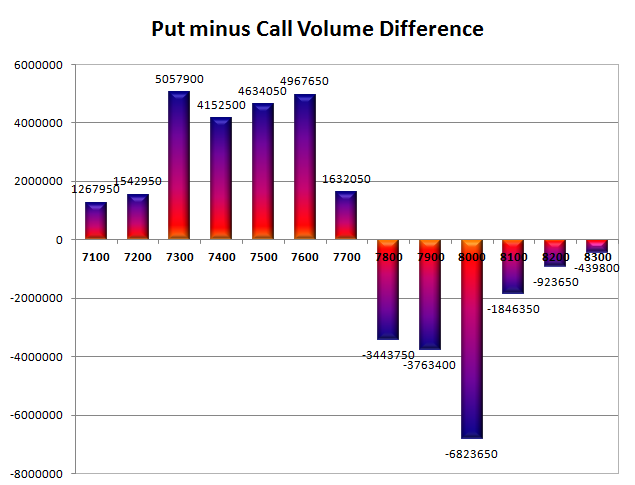 Day Range as per Option Table is 7557 - 7691 and as per VIX is 7570 - 7682 with 7620 as the Pivot.